Getting married is an exciting time in any couple's life. But with all that excitement comes lots of planning and work, and budgeting to ensure that you get everything you both want. We make it a little easier with our 10mm Argentium silver satin center wedding ring with decorative and beveled edge. This option is affordable, but still high-quality, offering the best of both worlds. 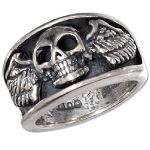 Men who love the look and feel of sterling silver will appreciate the beauty of this ring. 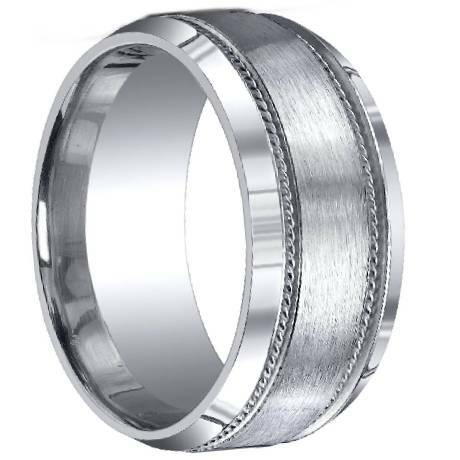 Made with a flat brushed satin face and trimmed with a decorative edge, this handsome wedding ring has polished beveled edges and a comfort fit band. 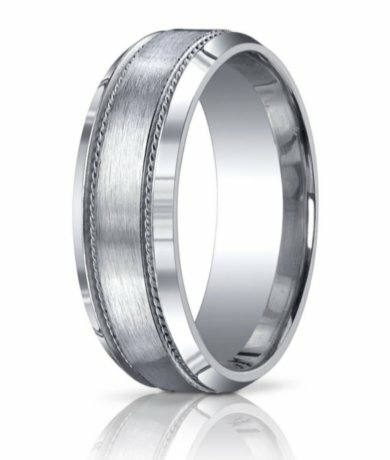 This is a great option for the groom who prefers things a little more modern, a little more embellished than just a plain band. We recommend having your finger sized by your local jewelry store before placing your order. Comfort fit bands tend to run ½ size smaller due to the additional metal inside the ring. We understand that it can be hard to find everything you want when shopping and planning a wedding. However, we do our best to ensure that our 10mm Argentium silver satin center wedding ring with decorative and beveled edge is affordable and high-quality. We even offer custom engraving up to 30 characters!